That’s what Nigel Jones, book reviewer for Devonshire magazine, writes in the latest edition which is out now. The man who broke the bank, Charles Deville Wells, lived at an address in Walker Terrace, Plymouth, from about 1883 to about 1887. From here he registered a number of patents on his inventions, which included multiple-wick candles, advertising by means of balloons, electric baths, and a “combined fire extinguishing grenade and chandelier”! Some years later, he returned in his sumptuous yacht, Palais Royal, and it was here that the finishing touches to the vessel were carried out by local shipwrights. You couldn’t really make up this story. It’s actual real life stuff that’s both unbelievable, extraordinary and true. It’s an epic story regarding the battle man faces to pay the bills (silver spoons excluded here). Charles Deville Wells takes this battle to extraordinary levels in terms of perseverance, innovation and also trickery and fraud. Initially an engineer, Wells takes to developing products which he patents and then seeks investors to reap the harvest, of which there’s usually none. Later Wells indeed does break the bank at Monte Carlo, making unheard of amounts of money, then loses it on incredible projects and continues to evade the law and investors. At one point, he bases his operation in Plymouth, so great local references also. The best book I’ve read all year, the level of research that’s gone into this excellent book by Robin Quinn is staggering. A thoroughly entertaining, interesting read that’s highly recommended. P.S. Christmas is coming! (How could we fail to notice!) If someone you know likes Victorian crime books, buy them a copy of The Man who Broke the Bank at Monte Carlo. If they enjoy it as much as reviewer Nigel Jones evidently did, they should be in for a very happy Christmas! It’s available online from a variety of booksellers including Amazon, Waterstones, WH Smith, and iTunes. 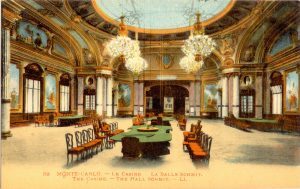 A gambling hall at the Monte Carlo Casino, the Salle Touzet, named after the architect responsible for its design. It first opened in 1890, was temporarily closed, and re-opened just after Charles Wells had broken the bank in November 1891. Whatever his secret, Charles Wells was one of the main topics of conversation in Britain and elsewhere. Following the lead of the popular press, people began to call him ‘Monte Carlo Wells’. The name stuck, and for the rest of his life – and beyond – he was frequently referred to by this nickname. 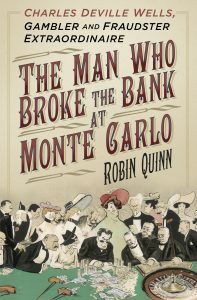 For a detailed discussion of how Wells broke the bank, please see my book, The Man who Broke the Bank at Monte Carlo, especially pages 227-238. Other sources for this blog post: Sheffield Evening Telegraph, 18 and 19 November 1891; Aberdeen Free Press, 19 November 1891; Bridport News, 20 November 1891. These newspapers can be accessed online via the British Newspaper Archive, which I thoroughly recommend: http://www.britishnewspaperarchive.co.uk/ The site offers a free trial initially. Various subscription packages are then available. Having subscribed, if you do not renew you will sooner or later be offered one month of access to the site for just £1 to tempt you back! This is unbeatable value. (Please note that this is an unsolicited testimonial – I am a satisfied user of the site, but have no connection whatsoever with it). Back in September The Times published the obituary of Eduard Luedtke, who had just died at the age of 91. The piece was headed ‘Last of the German prisoners of war who worked on English farms during the war and then settled here in peacetime’ (see my blog post of 1 November). But in fact he was only one of the last. When the obituary appeared, ex-POW Theo Dengel contacted The Times to let them know that he was still alive and kicking —“or just about”. Elsewhere a woman anxiously called her grandfather – another former prisoner of war – to make sure he was OK. Accordingly, a piece appeared in yesterday’s Times (page 90), as part of the paper’s Armistice coverage. Written by journalist Nigel Farndale, it mentions several of the surviving German ex-prisoners, while providing an excellent account of the 400,000 German POWs who were in Britain between 1939 and 1948. Nigel used my book, Hitler’s Last Army, as a source of information for the feature and kindly acknowledged this in his piece. Online version here. The BBC Two drama, Close to the Enemy tells the story of a German scientist just after WW2 who is brought to Britain to help with the development of the jet engine. … The scientists, all of whom are non-Nazis, will work at Farnborough, Hants, where they will live in a special hostel and will be waited on by German prisoners of war. They have been working in German research stations and will be paid the same salaries as they received there. … In the disarmament of Germany … it was decided that this vital realm of research should not be left intact in Germany … America, Russia, and Britain had now agreed that so many of these scientists should go to each of the three countries to cooperate with their own scientists. About 25 would be coming to this country. In Hitler’s Last Army I describe many of the other occupations in which German prisoners of war were engaged in Britain, both during and after the war. Many people would be astonished to learn, for example, that trusted German POWs were given the task of compiling records of Nazis who were wanted for war crimes; other detainees had the job of keeping an up-to-date index of all POWs in British camps. 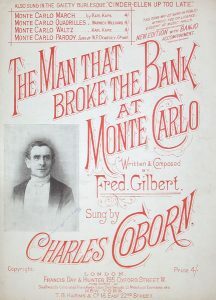 Sheet music for The Man who Broke the Bank at Monte Carlo, written by songwriter Fred Gilbert. The photograph (inset) is of Charles Coborn. 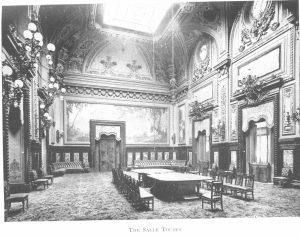 After Charles Deville Wells had won further large sums of money at Monte Carlo, lengthy articles had appeared in The Times and The Daily Telegraph, based on an interview with Wells (see blog post for 7 November). If the legend is true, it was probably at the time of this conspicuous press coverage that Gilbert might have seen a poster such as this. Gilbert immediately turned the headline into a song, and sold it to the famous music-hall singer Charles Coborn. It was published in late 1891 and was probably first performed in February 1892 when Coborn sang it as part of his act at a London music-hall. It subsequently became one of the most popular and enduring songs of all time, and undoubtedly turned Wells into a lasting legend. Coborn later said that he must have sung it at least a quarter of a million times, and as his career lasted almost until his death in 1945, this is perhaps not such an exaggeration as it might seem. Click here to see and hear a Youtube clip of Coborn performing this number in the 1934 film Say it with Flowers. This appears to capture the atmosphere of a Victorian music-hall to perfection. (In fact the era of the music-hall had not yet ended at this date, and Coborn was still performing the song on stage – probably on a daily basis). An alternative Youtube video can be seen here. In my opinion, however, this performance lacks the atmosphere of the previous one, having been filmed without an audience present. Watch them both and see which you prefer! 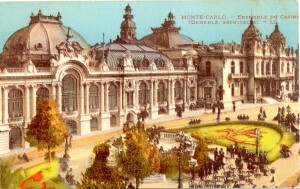 A view of the famous Monte Carlo Casino from the south-western side, overlooking the harbour. This was the day when The Times and The Daily Telegraph published their respective accounts of the interview they had conducted with Charles Wells two days earlier. The report from the Telegraph is reproduced in full in my previous blog post of 7 November. The Times published a similar version, but went into rather more detail on his gambling ‘system’, which Wells claimed to be ‘as nearly infallible as human ingenuity can make it’. During September and October 1891, Wells placed classified advertisements in The Times; The Standard; The Morning Post; St. James’s Gazette; and the Pall Mall Gazette. In an effort to find wealthy investors to finance his gambling activities, Wells had embarked on an intensive advertising campaign. He already had a reputation as “king of the classifieds”, having placed hundreds of small-ads over the last few years in connection with a scam involving inventions and patents. In the first half of September 1891, he placed ads – similar to the one shown here – in almost every edition of the Morning Post, Pall Mall Gazette, St. James’s Gazette, and some other papers, including The Times itself. With its headline of ‘Thirty Thousand Pounds Monthly’ the advertisement strongly resembled an earlier one that Wells had used for his patents fraud (‘Thirty Thousand Pounds in Three Months, and probably more yearly, is the certain product of a share in a patent …’). For some reason he stopped advertising, but started again a month later, on 12 October. Perhaps he needed this respite to evaluate the replies he had received. ‘It does not seem to me that he has made any very novel discovery in the science of playing roulette and trente-et-quarante … The secret of his success rather seems to be in the courageous way in which he attacks the tables and his cool-headed manner of treating either great success or any rebuff which might be encountered. Most men get excited in either event and lose control over their play, and then the table has its turn. But Mr. Wells keeps on steadily with his double stakes, which in total range from 6,000f. to 24,000f., … following up the table assiduously with the maximum when a series is running, and dropping the stakes to smaller amounts when the cards are persistently intermittent. All this has been done thousands of times before, but few have had the courage to risk repeatedly for 11 hours a day close upon a thousand pounds [£100,000 in today’s values] at almost every coup. In the long series for which all old hands are ever on the alert he would make five or six thousand pounds [£500,000 – £600,000] in a few minutes, and accomplish the feat of breaking the table several times a day’. The Times Digital Archive: http://www.gale.com/the-times-digital-archive/ (Available on subscription only. However, access is available through membership of many local libraries). 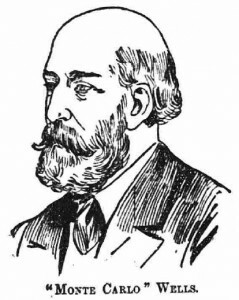 Charles Deville Wells broke the bank several times in 1891. 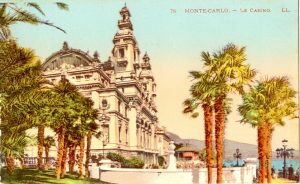 Having arrived back in Monte Carlo a few days earlier [see recent blog posts], Charles Deville Wells had gone on to win yet another fortune at the gaming tables. By 7 November, 1891, public interest in his exploits had reached fever pitch. The Times and The Daily Telegraph each sent a journalist out to Monaco to watch him gamble. This was the first time that London-based reporters had been in a position to give a first-hand account of Wells’ activities. It was also the occasion when he gave his first-ever ‘press conference’, with the two newspaper men hanging on to his every word. In The Man who Broke the Bank at Monte Carlo, I include some short extracts from this coverage, but here, in its entirety, is the Telegraph article dated 8 November – the day after the interview – and printed in the following day’s edition. Mr. Wells, the lucky Englishman, closed his campaign against the Monte Carlo gambling tables last night, and left for England, the winner of £28,000. This, added to the £32,000 won in July, makes a sum total of £60,000 winnings [equivalent to £6 million today]. On Friday last he cleared £10,000, and broke the bank five times in the evening. He had before him a pile of thousand-franc notes a foot and a half high, but he never lost his head at play, and afterwards slept soundly with them under his pillow in a room at the Hotel de Paris, overlooking the Place du Casino. The Casino viewed from the Hotel de Paris. Charles Wells crossed the square (right foreground) to the hotel, staggering under the weight of a million francs in banknotes, and slept with them under his pillow. I then asked Mr. Wells if he cared to give to the world in general and players in particular the advantages of his system, but he declined. Players, he said, had watched him and tried to do likewise, but the great majority had not pluck enough to follow him even when they saw him winning. His system required £6,000 capital,** as it must for the most part be played with the maximum stakes of 6,000 and 12,000 francs, so as to enable the player to withstand a considerable run of adverse luck. He acknowledged that one of his principal points was to follow the table, and catch ‘runs’ or ‘series’ as on Thursday and Friday, when with 12,000 francs on each of the two chances he was able to clear the table of its capital several times. Again, at one o’ clock yesterday, he had taken all of the 100 and the 1,000 franc banknotes supplied to the trente-et-quarante table, and the croupiers were obliged to pay one deal in small odd notes and rolls of gold*** until another £4,000 had been brought by the cashier. All this naturally afforded splendid sport for the spectators, who rejoiced at so successful an attack upon the enemy. Mr. Wells added that when the cards were running awkwardly he placed smaller stakes, but for ‘series’ he placed the maximum of 12,000f on each of his chances. He always insured against a ‘refait’ (the bank’s odd chance); and though this cost him at the rate of 1 per cent. upon his stakes — over £1,000 a day — he believed it paid him. Then he never tempted good Dame Fortune too far, and sent off his winnings to London daily, and left when his luck turned. That, he admitted, was a great help even to this system of his, and finding yesterday that he was making no progress, he packed up his portmanteau. * Wells did in fact return two months later, in January 1892. I’ll be recalling the events of that visit 125 years on. ** £6,000 was the sum which he wanted investors to provide in return for “Thirty thousand pounds a month”. (See my blog post of 2 November, in which his actual newspaper advertisement is reproduced, and the post of 5 November, in which a magazine editor suggests that the proposition is fraudulent). *** ‘Rolls of gold’: these were cylindrical paper packets wrapped around a small stack of coins of a certain total value. On the continent of Europe this is a common way for banks to dispense quantities of small change. On this day in 1891, Charles Wells was on a winning streak again at the Monte Carlo Casino. But his past as a fraudster was already threatening to catch up with him. Exactly 125 years ago, a London magazine called Truth ran an article on Wells – the latest of many. It is very clear that suspicions were already mounting, but at this point no-one was quite prepared to state that Wells, the fraudster, and Wells, the Monte Carlo bank breaker, were one and the same person. Before long, though, an enterprising journalist from the Evening News would show that this was indeed the case. The revelation would mark the beginning of turbulent times for Charles Deville Wells. Commencing yesterday with the modest sum of six louis*, and gradually increasing the amount, he in the course of the sitting won the sum of 98,000 francs [thus more or less recouping the sum he had lost earlier]. An excited crowd gathered round the tables in the Casino today to watch the successful player, and their expectations were not disappointed. 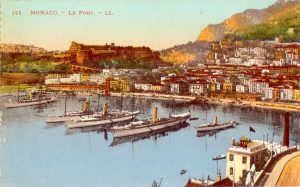 Mr. Wells made a vigorous attack on the bank, and at the close of play had amassed a pile of 70,000 f, bringing up the total of his winnings since his arrival in Monte Carlo to over 250,000 f [£1 million]. Charles Deville Wells had snatched victory from the jaws of defeat. But would luck be on his side for the rest of his stay, or would the Casino win back everything he had won so far? *The louis was a small gold coin with a face value of 20 francs [worth about £100 in present-day purchasing power]. NOTE: The news report quoted above was published in The Times of 6 November, 1891. In that era a delay of a couple of days in reporting news from afar was not unusual. I was fascinated to see how – over the following days – many smaller British papers shamelessly copied the Times article, often word-for-word. Some credited The Times as their source, while others did not. Some even had the audacity to use such phrases as ‘from our correspondent’ to make it appear that the piece was their own ‘scoop’. In fact, it would have been prohibitively expensive for local and provincial newspapers to have overseas correspondents in all parts of the world to report such stories. After he had broken the bank at Monte Carlo in late July to early August 1891, Charles Deville Wells had kept a low profile. He had, however, placed anonymous classified advertisements in The Times and other newspapers requesting funding to the tune of £6,000 – equivalent to £600,000 today – to finance another trip to Monte Carlo. At least two replies were from people from whom he had already obtained large amounts of cash through one of his fraudulent schemes. And this time he managed to extract another few thousand pounds from each of them. 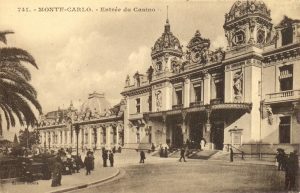 Wells reappeared at Monte Carlo’s famous casino on this day 125 years ago. * His arrival was unexpected and went generally unreported. He was, however, recognised by the local Reuter’s correspondent, who hurriedly dispatched a brief telegram to London — so brief, in fact, that all but the most observant readers would have missed it. It was beginning to look as if Wells’ intention to return and break the bank had failed. Had his famous gambling system let him down? Had the casino found some way to thwart his plans? Or was it just that his luck had run out? The next few days would be decisive. *In The Man who Broke the Bank at Monte Carlo, I state that he returned “on 4 November, or thereabouts” (p. 83). Information which has come to light since the book’s publication suggests that he revisited the casino on 2 November.